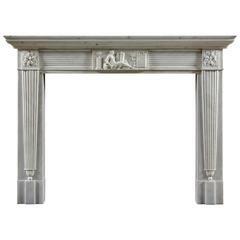 An unusual 19th century Welsh slate Regency “Greek-Revival” chimneypiece. The frieze and jambs are decorated with recessed Greek key motifs and the end-blocks with stiff leaf paterae, circa 1820. A nice and wide Empire style fireplace mantel executed in Belgian blue stone. Paris region, France, 19th century. Great original patina, minor restorations. Ready to be shipped. 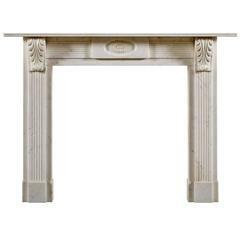 Solid antique French limestone fireplace mantel. Perfect usable measurements.